The region of eastern Europe with a large population, the cities are crowded, developed traffic network, there are many famous industrial distribution: Kuzba, the southeast of the west Siberian plain, the Lake Baikal industrial zone (northwest of baikal) and the industrial industrial zone of the former Soviet union's largest munitions industrial zone. In an area where industry is growing rapidly, protective clothing is essential, and recently a customer in eastern Europe has been consulting our flame retardant antistatic protective clothing.It is easy to generate static electricity in winter, the harm of static electricity should be not ignored, because static accident is not a few, and so many workers in industrial area, in order to better protect the safety of workers, industrial zone must be equipped with flame retardant anti-static protective clothing. Xinxiang Yulong textile production of flame retardant anti-static protective clothing use antistatic fabrics, this kind of fabrics with clear grain, colour and lustre is full environmental protection and comfortably don't wrinkle prick the hand, smooth paste etc, it can be also on the basis of the anti-static function, increase the flame retardant, arc, such as fluorescent effect. The flame retardant anti-static protective clothing suitable for mines, electric power, oil, natural gas, oil refineries, chemical and other electric arc spraying and other exists and is sensitive to electrostatic complex work, or explosive dangerous location. This flame-retardant antistatic protective clothing can be made according to the requirements of the eastern European customers, plus our clothing master's suggestion for the environment. This client has been cooperating with us. 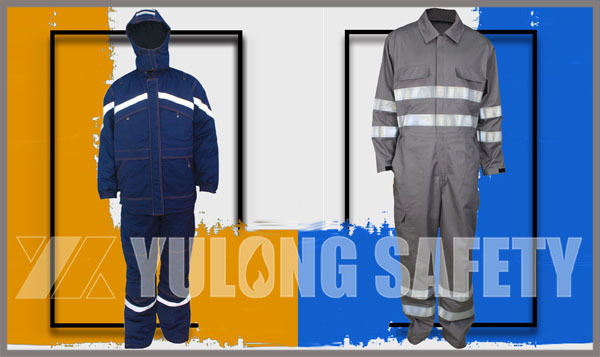 Yulong textile has a professional technical team, in the production of clothing to be perfect to every detail requirement, responsible for the product, responsible for the customer, on the way of safety protection, Yulong always walk with you.